Most of the time, an employer’s decision to hire a candidate has little to do with formalized credentials, and everything to do with the approach that person takes during the application process. And if you are interested in working at a startup, fitting the culture might be more important than anything else on your resume. Unless you’re completely clear about what it is you want to do and how you can create value employers aren’t typically looking. It’s not because you would necessarily make bad hires, but more often than not, your request creates even more work for them. “I heard your CEO Isaac Morehouse speak a while back and, as a result, have been tracking the progress of Praxis. I admire what you guys are doing and strongly believe in the necessity of disrupting the education system. A better way to go about this is to list three very clear things you could do for the company you’re looking to work for. Instead of saying “social media marketing,” give them three specific social campaign ideas, how you would create them, and what value they might bring. Treat yourself like a product that you have to sell to a business and be clear about the benefits of the product to your customer. It is your responsibility to demonstrate your value to an employer. When employers hire someone at a startup, they do so under the assumption that they will get more value out of that person than they have to pay back in salary. While this seems obvious, most people forget this entirely when they apply to jobs. Not Nina. 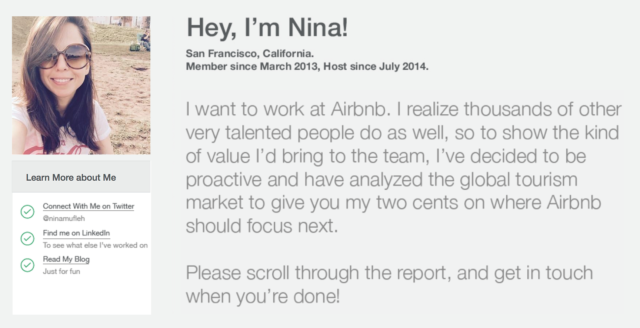 When Nina wanted to get hired by Airbnb, she created an online resume that included a growth strategy for Airbnb. In other words, she did the job before she got the job. This allowed her to prove that she could create value at the company in a way a resume or a degree never can. Even if your project isn’t used by the company, it will help you get past the traditional barriers to entry like resume stacks and HR departments. If there’s one thing you can do for your job prospects at a startup, it’s to start building a digital paper trail now. If you’re interested in marketing, build a profile in Inbound.org, Medium, Quora, and a personal website. Start marketing, podcasting, saving ads you like, or documenting your work and learning in the field. If you want to be a developer, start building your GitHub profile now. 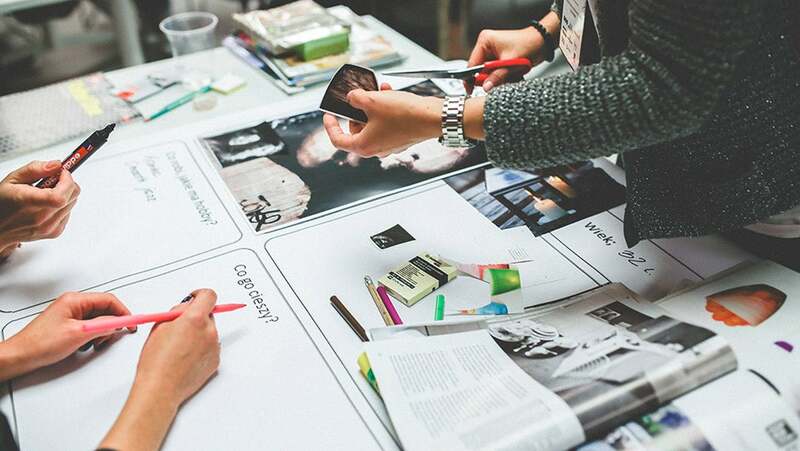 The goal is to have a sizable “paper trail” in your chosen field that shows your the world that you’re interested in what you’re doing and have something interesting to say about it. After all, the more work you’ve done in the past, the easier it will be to hire you in the future at a startup. Derek Magill is a college dropout, marketer, business strategist and career expert. He is currently the Director of Marketing at Praxis.